(CBS/AP) RIYADH, Saudi Arabia - U.S. Secretary of State Hillary Rodham Clinton says Iran and six world powers have agreed to meet in Istanbul on April 13 for the latest round of talks about Iran's nuclear program. 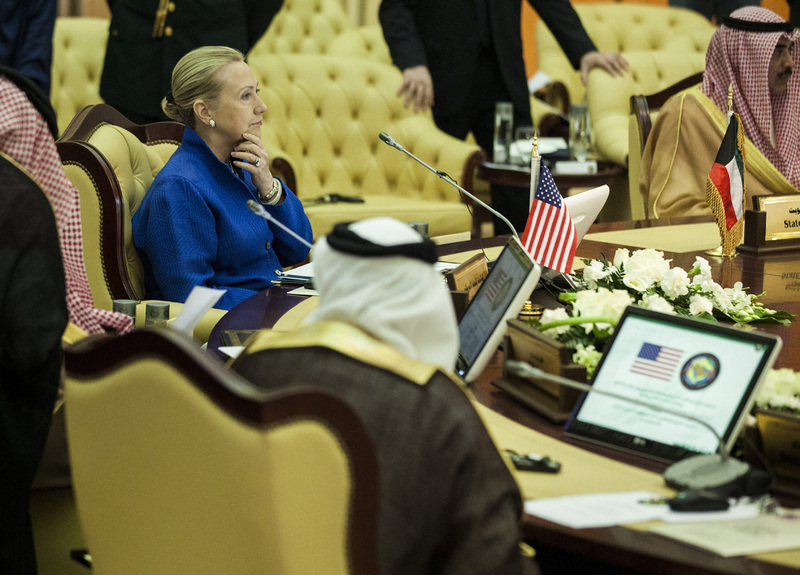 Clinton made the announcement at a news conference Saturday following a security conference in Saudi Arabia. That conference focused on the nuclear program, which the U.S. and other believe is intended to develop nuclear weapons, and on military threats from Iran in the Persian Gulf region. Iran and the six nations  the United States, Britain, France, Germany, Russia and China  met in Istanbul 14 months ago. But the talks ended after two days with the sides agree on what to talk about. Iran contends the program is solely for peaceful energy and research purposes. Clinton made clear Saturday that time is running out for diplomacy with Iran over its disputed nuclear program, saying Tehran's "window of opportunity" for a peaceful resolution "will not remain open forever." Her remarks at a security conference in Saudi Arabia follow President Barack Obama's announcement Friday that the U.S. was moving ahead with penalties aimed at depriving Iran of oil revenue, while also working with Saudi Arabia and other Persian Gulf states to ensure ample global petroleum supplies. Clinton prodded Gulf governments to develop a coordinated defense strategy against Iranian missiles. With tensions rising in the region, she said American and Gulf militaries should cooperate to improve maritime security as well. Underscoring the limits of U.S.-Gulf cooperation, however, U.S. officials confirmed Saturday that the United Arab Emirates had shut down an American-funded democracy group, following similar Emirates action against a German organization this past week. Discussions also covered ways to pressure Syrian President Bashar Assad to end a year of bloodshed from the uprising against his rule, but the focus was on Iran. "It soon will be clear whether Iran's leaders are prepared to have a serious, credible discussion about their nuclear program, whether they are ready to start building the basis of a resolution to this very serious problem," Clinton told reporters. "It is up to Iran whether they are ready to make the right choice. ... What is certain is that Iran's window of opportunity to seek and obtain a peaceful resolution will not remain open forever." She said pressure from the economic penalties and international isolation was increasing on Iran to show it is serious about satisfying the world's concerns. International negotiations with Iran over its nuclear program will resume in April in Turkey, she said. But skepticism persists over Iran's intentions. Tehran has used past talks to delay sanctions or try to divide the international front, while pressing ahead with its nuclear program. Speculation over a possible U.S. or Israel military attack is adding urgency to the next round of discussions. Mr. Obama has underlined the need to give time for diplomacy alongside penalties. He said Friday that the U.S. would move ahead with potential measures against U.S. allies and other countries that keep buying Iranian oil. It was the latest step in the campaign to starve Iran of money for its nuclear activity. The president said the world oil market was tight, but deep enough to keep the squeeze on Iran. Clinton, who met Friday for almost two hours with Saudi King Abdullah, said the U.S. and Saudi Arabia share an interest in ensuring stable energy markets that foster economic growth. She recognized the kingdom's efforts to meet increased market demand for countries weaning themselves off Iranian petroleum imports. She also said the U.S. and Sunni governments of the region would cooperate to counter Iranian threats against shipping in the Gulf and Tehran's support for "the Assad regime's murderous campaign." Before heading to Turkey for a 60-nation "Friends of the Syrian People" meeting Sunday, Clinton lamented what she called the Assad government's shelling of civilian neighborhoods and targeting of mosques and churches. She said these attacks have continued despite Assad's acceptance of U.N. mediator Kofi Annan's plan to end the crisis. That plan includes an immediate cease-fire and an eventual democratic transition. In a concluding statement, the U.S. and the other countries at Saturday's meeting urged Annan to issue a timeline for putting his plan in place. The U.S. and other foes of Assad are struggling to settle on a strategy even as Annan's plan founders. Western diplomats want to give diplomacy a chance, having invested months of effort to persuade Russia and China, veto-holding members of the U.N. Security Council, to unite behind a common approach. But they, like the Syrian opposition, fear Assad may only be playing for time. Assad said he wants the plan to succeed, but insists the opposition must first commit to a cease-fire. The West says the Syrian government must pull back its troops first, and U.S. officials say much of the diplomacy right now concerns the choreography of how the two sides would lay down their arms. More than 9,000 people have been killed in Syria's violence since last March, according to U.N. estimates. Gulf countries such as Saudi Arabia and Qatar are among the most impatient and have spoken about possible military intervention, from arming Syria's badly overmatched rebels to creating safe zones from which the rebels can operate. Washington is asking them to hold off, fearing that a military escalation could lead to all-out civil war and play into Assad's hands, considering his vastly more powerful military. Clinton said officials meeting in Turkey would discuss "additional steps to increase pressure on the regime, provide humanitarian assistance despite the efforts of the regime to block access and advance plans for an inclusive, democratic and orderly transition that addresses the aspirations of the Syrian people." Clinton also expressed concern about increased pressure across the region on civic groups, in particular those advocating political or democratic reforms. It was an apparent reference to the Emirates' move this past week against the U.S.-based National Democratic Institute and Germany's Konrad Adenauer Foundation. Clinton underscored her disappointment in a private conversation Saturday with Foreign Minister Abdullah bin Zayed, U.S. officials said. She urged authorities to reconsider the decision.